When a California couple remodeled their home to capture a modern ‘Hollywood Glamour’ style, the backyard was not forgotten. They called upon the team at Lori Gentile Interior Design to handle the entire project, leveraging the firm’s expertise in creative problem solving, design versatility and customization. The design challenge was to create a beautiful outdoor living area that extended the new interior style to the backyard, orienting the entire space around an impressive centerpiece sculpture. To accomplish this, the team designed two new vaulted pergolas to replace a flat trellis, so the homeowners and their guests could see through to the sculpture. Lori pulled from her 30+ years of experience in customizing design elements to complete the remaining details. 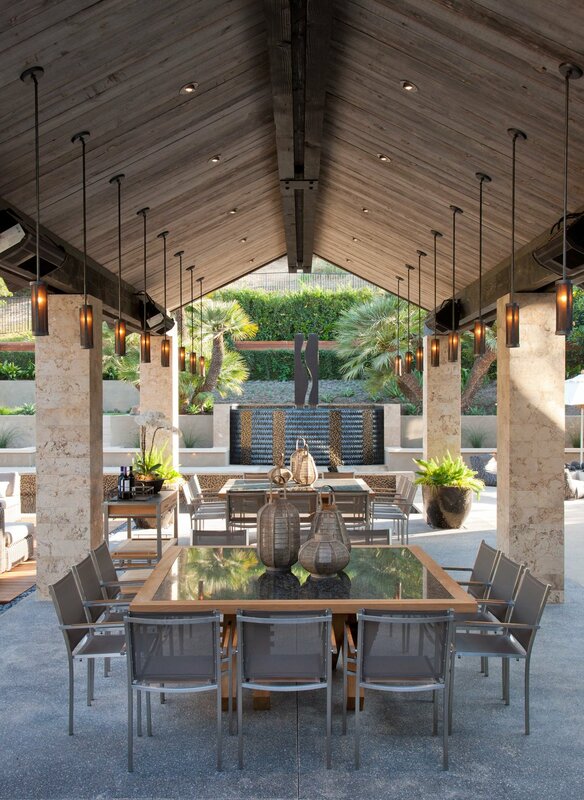 For the lighting, several mesh fixture designs from the Hammerton Contemporary collection were modified to accommodate a UL damp rating for outdoor use. 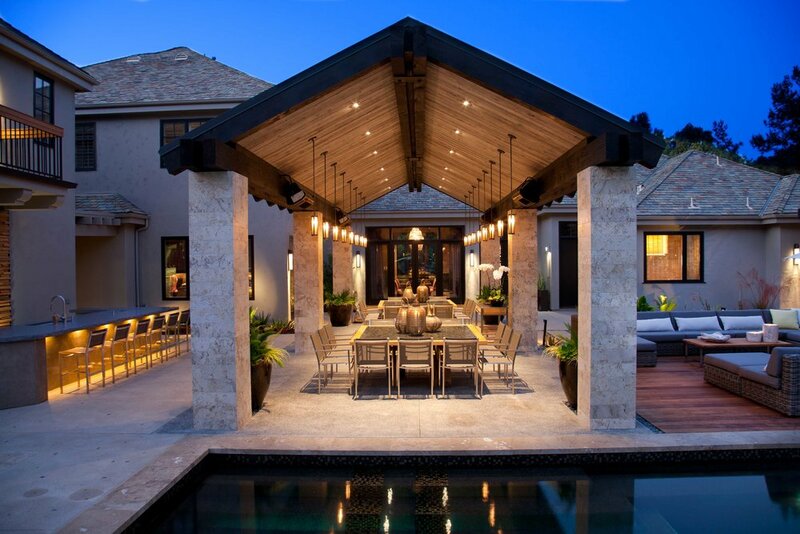 A gauzy glow from two rows of pendants flank each side of the pergola, leading eyes to the sculpture and providing plenty of light for nighttime entertaining. 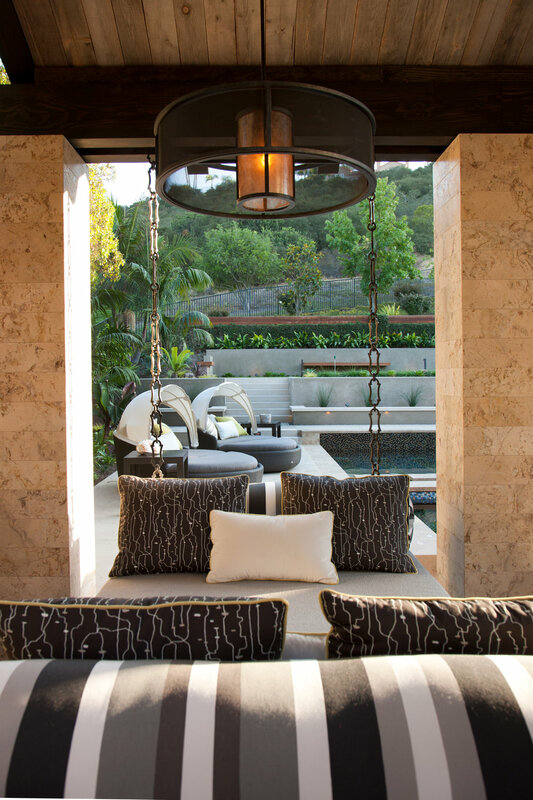 The second pergola, conveniently situated next to the Jacuzzi, features a luxurious bed suspended from decorative custom chains beneath a Hammerton mesh drum chandelier. An eco-smart fireplace provides warmth and ambiance with a 3form backlighted panel above, showcasing the accessories on display.